Americans may have a crush on summer squash; in Italy it’s zucchini that’s bene, and some French will say (when they parlay) that courgettes are the best you can get. However, whatever name they claim, throughout the world, courgettes are simply yum! A type of summer squash, courgettes (Cucurbita pepo) are basically small marrows, green or yellow in colour and harvested when young. There are a number of varieties available, including black beauty, black coral and gold rush. Ideally, courgettes should be sown in seed trays or pots – at a depth of three times the seed’s diameter – to ensure a good start. Soak seeds overnight before sowing to encourage germination and include two seeds per pot, choosing the strongest of the two when planting out 4-6 weeks later. Because they are very frost tender, courgettes are not so hot on being cool as cucumbers when it comes to planting conditions. Soil temperatures should be approximately 20-35 degrees Celsius. As a rule of thumb, those in most areas of New Zealand should look to plant out during summer. Northland enjoys a longer season and southern gardeners may need to wait until mid summer before they’re able to grow for the table. When planting out, look for a sunny section of the garden with rich, free-draining soil and dig in plenty of compost. Courgettes can easily grow to cover a few metres, so space seedlings at least 70cm, and up to one metre, apart to allow plenty of room for their stems to develop. It’s also a good idea to grow in garden corners so they don’t overrun other plants. Be careful not to damage roots when planting. Backfill to the height of a slight mound, firm soil and then water in well. Because courgette plants do deliver a prolific crop, stagger planting to provide an ongoing supply throughout the season. Due to their high water content, courgettes require a heavy hand with the watering can, particularly in summer. Ensure soil is kept moist, but not boggy. Mulch regularly to ensure roots are well insulated. Stems can be trained or cut to control growth. Powdery mildew can be problematic, particularly towards the end of as summer. If so, remove affected leaves immediately. Courgettes will usually be ripe for the picking within six weeks to two months, however if temperatures are a little slow to get going in spring, delays can result. Generally speaking, once courgettes reach 15-20cm or so in length, they’re ready for harvest. However, ‘baby’ courgettes can be plucked from their cradle as small as 10cm. Leave a couple of centimetres space between the courgette and the stem when cutting. To encourage a regular yield, keep picking as courgettes develop. Be vigilant in this because (depending on tastes) it’s essential they are removed before they develop into marrows and that can be virtually overnight. Although courgettes are not absolutely loaded with vitamins, depending on the variety, they do feature vitamins A, B and C, as well as zinc, potassium, phosphorous and manganese, and their skins are a good source of fibre. What’s more, their high water content means those who do partake, will also be picking up ‘good hydrations’ at a low calorie cost! 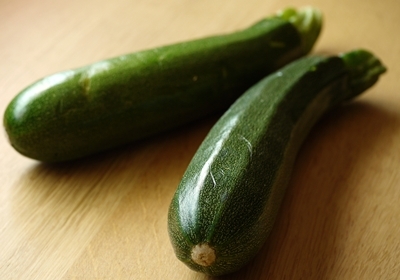 Courgettes do not store well, but excess crops can be pickled or made into jams or chutneys. Versatile in the kitchen, courgettes absorb flavours very well. They can simply be shallow fried in a little olive oil and seasoned with salt, pepper and a drizzle of balsamic vinegar, or employed as an ingredient in stews, stir fries or soups. Microwaved for just a couple of minutes and served mixed with lightly microwaved carrot slices can make for a simple but colourful veggie dish. In addition, male courgette flowers are edible and can be used as a garnish.